If you have been following the blog at all over the past six months, you will probably have noticed that I (Joel) am big on crowdfunding : ) For over a year now, I have been tracking the movement that I believe will reinvent the way companies are created and financed. Over the course of the last year+, I have seen many amazing projects get their wings using crowdfunding worldwide – but it is only the beginning! That’s why we are starting a new blog series – Crowded Judgment: projects worth crowdfunding– to showcase exciting, inspiring and historic projects from around the crowdfunding world. Back at the beginning of the year, I strapped on my backpack and headed down to South America to conduct a ‘study’ (mycrowdfundingstudy.com) on the crowdfunding phenomenon in Latin America (LatAm). What I saw down there was so sensational that I decided to start preparing Lumos for the coming crowdfunding craze. With subsequent trips to London (see blog post Finance 2.0 – Wall Street Meets the Web) and now Toronto, it has been amazing to see how the movement is taking shape globally. What I have realized through all this movement, is that this is something that is truly global, truly collaborative and truly collective. While some sites may brand themselves as global (ie. 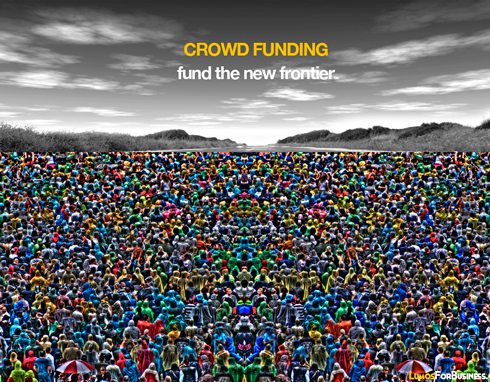 Indiegogo) and others may be focused on specific regions or communities (ie Catarse and Fundweaver), all the sites are contributing to form an interconnected crowdfunding ecosystem that transcends borders, cultures and politics. This is the beginning of a whole new era of finance, so without further ado, lets check out the top projects (past and present) from around the world. LUMOback – A project based out of the US that is making use of technology to creatively solve a big problem for a lot of people – posture. Banner Bag – A project out of Mexico, posted on the Idea.me platform, that hopes to raise $5,557 USD to turn all of the signs and banners from the upcoming 2012 Mexican elections into recycled bags for low-income children. While you won’t be able to understand the video if you don’t speak Spanish, you can contribute to the campaign on the Idea.me platform using PayPal, anywhere from $8 USD and up. Vamos! Love for Karen H Klein – After seeing a video on YouTube of bus monitor Karen Klein being mercilessly bullied by middle-school students in Greece, New York, IndieGoGo setup a campaign to raise $5,000 for her to go on vacation. Well with 23 days still left in the campaign, Karen is going to have one helluva vacation. The campaign has already raised over $600,000 and is still growing. #CrowdfundPaRato is a project out of Spain that was created to bring the former head of a failed Spanish bank, Rodrigo Rato, to trial for his role in the Spanish banking crisis. The campaign was funded in under 36 hours, and may set a new precedent for public trials of corrupt financiers and politicians. Cupula dos Povos is a project from Brazil that was created for the Rio+20 conference on Sustainable Development in Rio de Janeiro last week. The project’s creators wanted to raise funds (initial goal of 12,000 Reais, or 7,000 USD) to bring social and environmental activists from all over Brazil to the conference in order to protest. The campaign ended up raising over 40,000 Reais, or 22,000 USD, and set a Brazilian record for number of people who financed the project. DREAM:IN is a project developed in Brazil whose goal is to create a collective online platform for people to collaborate around new ideas and solutions to public problems. Students from universities around Brazil are out collecting the thoughts of everyday people in order to identify the dreams and aspirations of the Brazilian population. Leaders and project participants will gather at a conference in August to present the ideas, and the public will be able to collaborate from anywhere via the platform. A week and a half after its launch, the landmark Brazilian film, Belo Monte – Announcement of a War, has over 50,000 views. The project was funded on Catarse in November 2011 for a more than $140,000 Reais.